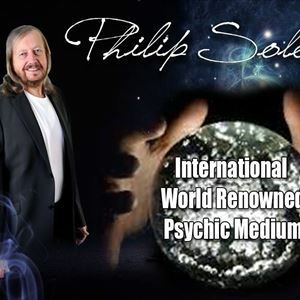 Philip Solomon has been acknowledged by many as one of the best psychic mediums in the world. On the evening he will be demonstrating mediumship and clairvoyance. Solomon has demonstrated in some of the major venues all over the world, he is the author of 20 published books and a feature columnist for numerous magazines and newspapers, including Take A Break's Fate and Fortune and Spirit & Destiny magazines and Psychic World newspaper. For many years he was the Psychic Agony Uncle for the Wolverhampton Express & Star newspaper. This will be an evening when many will be reunited with their loved ones from the Other Side. All will be uplifted by the accuracy, care and understanding he shows to all. Known as the Psychic Medium To The Stars, he modestly describes himself as a very ordinary man but with a special gift.